Mamata Patel has no family history of breast cancer and lives a healthy lifestyle, including being a vegetarian, non-smoker and exercising regularly; and yet, she was diagnosed with the disease in both breasts at age 51. Mamata’s cancer was initially caught in one breast, but suspicious calcification in her other breast prompted her to follow up with her medical team for a second opinion. She endured three biopsies in each breast in less than two months – painful, but potentially lifesaving procedures that caught the cancer in her other breast. She had a bilateral mastectomy and finished treatment about a year after her diagnosis, in August 2008. With the immediate threat gone, Mamata says she shifted her focus toward connecting with other local survivors and raising money to support breast cancer research and treatments for local low-income patients. In 2009, she participated in the Komen Central Indiana Race for the Cure for the first time, raising enough money to earn a spot in the Pink Honor Roll, a list of the top 100 individual fundraisers for the Race. Mamata has continued her tradition of earning a spot on the Pink Honor Roll every year since, and has raised more than $19,500 since 2011. Thinking back to her first Race, Mamata remembers seeing waves and waves of pink everywhere and feeling overwhelmed by the number of people who cared and had in some way been affected by the disease. Mamata says she still wonders why she (and later, her sister) was diagnosed with breast cancer when there was no family history of the disease, nor did she meet any of the common risk factors, with the exception of being a female. This quest to find answers, along with her desire to help underinsured Hoosiers, continues to fuel her involvement with Komen Central Indiana. Mamata has served on the Pink Tie Ball committee for many years, in addition to other meaningful volunteer roles within the organization. 2017 marks the 10-year anniversary of Mamata’s survivorship. “I’m a survivor and a fighter and a conqueror; I’m a champion for other women,” she said proudly. Mamata Patel is one example of an everyday hero who is making a difference in the fight against breast cancer in ways big and small. 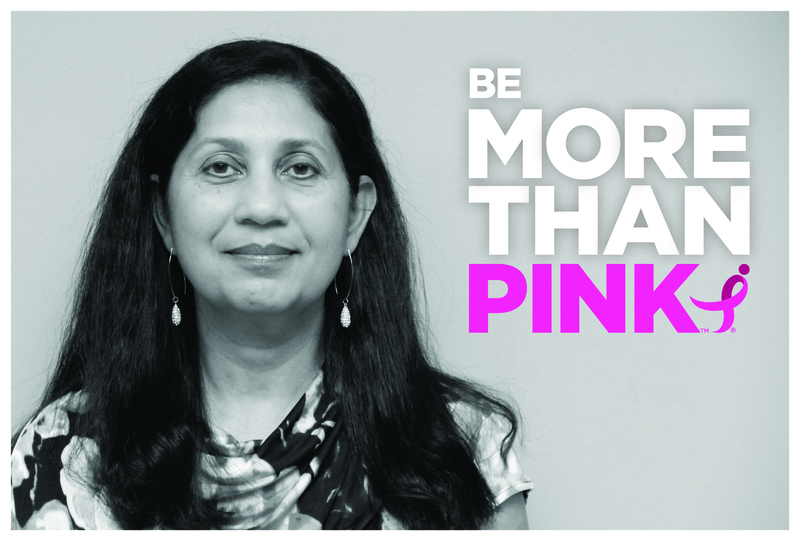 Join Mamata in being More Than Pink by getting involved with the Race.